This third installment of the TECHknitting series on hand sewing for hand knitters is about the running stitch. The running stitch is iconic--say "hand sewing," and this stitch is what most folks think of first. 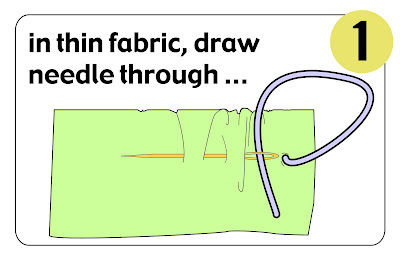 We'll get to the advantages and disadvantages of running stitch in a minute, but first, here are 4 illustrations showing the stitch itself. 2. 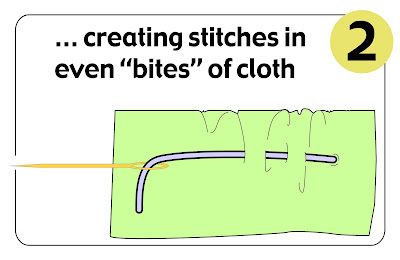 (above) In the shortcut method, the needle is drawn through even "bites" on the fabric face, creating stitches of even length. 3. (above) In bulky fabric, the shortcut method will cause bumps and puckers, and this is particularly true where several layers of fabric are being stitched together. 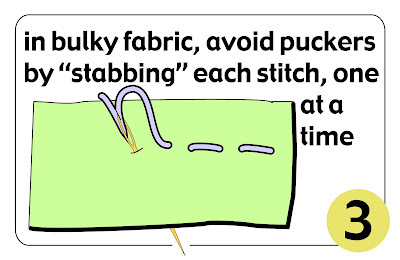 To avoid puckers, "stab down" on each stitch from the face of the fabric to the back, then return the needle by "stabbing up" from the back of the fabric to the face. Accomplished hand sewers, such as hand quilters, keep one hand above the fabric and one below, rapidly stabbing the needle up and down with each hand, alternately. When first learning this two-handed method, it is VERY easy to prick yourself with the needle, so go slow. 4. (above) Unlike some other hand sewing stitches, the running stitch looks the same on the front and the back. Hand knitters generally meet the running stitch in two different situations. First, it is often used to attach lining fabric to hand knitted fabric. Second, the running stitch is often used to sew up the lining fabric itself. Sadly, the running stitch is NOT actually good at either task. To sew lining fabric to itself (such as to close the end of the Polar fleece headband shown in the TECHknitting post of April 25, 2008) the back stitch is a far better choice, and a future post will be show more about the back stitch. To attach lining fabric to hand knitted fabric, such as attaching the Polar fleece headband to the hat in the headband post, the overcast stitch, is a far better choice, and a future post will show the overcast stitch in detail. 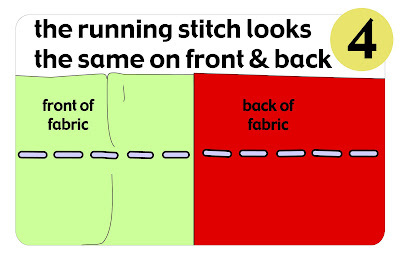 The running stitch is a poor choice for hand knitters because, as shown in illustrations 1-4, above, the running stitch "runs" straight through the fabric. Without any reserve "slack," when running stitch is stretched, it is likely to snap. As you can imagine, once the running thread is snapped, the running stitches would quickly unravel. Every time you put on or take off a knitted garment, these non-slack stitches stress, and will eventually break. Running stitch is really best for only one thing--BASTING (temporarily tacking fabric together before the "real sewing" takes place). After the real sewing, the basting is removed. When used for basting, the weakness of running stitch (it comes out easily) is actually a strength (you WANT basting to come out easily). Now, as you know, basting today is uncommon because it is time consuming. The modern trend is to skip basting and use pins instead: to pin fabrics together and then do the "real" sewing on the pinned-together fabrics. When you HAND-SEW fabrics together, pinning is a sensible, time saving substitution for basting--hand sewing goes slowly, so pins in the way can readily be re-positioned. However, for MACHINE SEWING, especially for machine sewing bulky hand knits, pinning is a poor substitute for basting. An example: suppose that you wanted to machine-sew a grosgrain ribbon backing onto a button band. 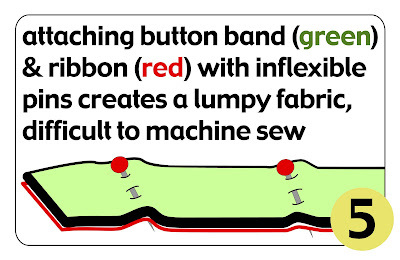 If you were to PIN the button band (green) to the ribbon (red), each pin would make a lump in the fabric, as shown in illustration 5, above. At each lump, your sewing machine foot must climb up, over, and then down the other side. Unless you are an expert machine-sewer, the result is likely to be a wandering line of stitches, with each stitch likely a different length. 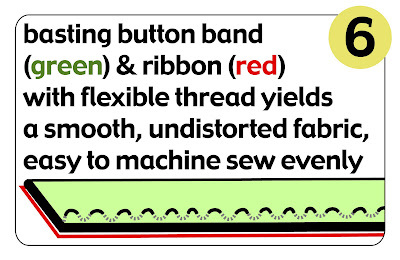 However, if you were to BASTE the ribbon (red) behind the button band (green) before machine sewing, the ribbon and the overlying button band would lie smoothly together, as shown in illustration 6, above. Basting makes it more likely that your precious hand knits will emerge from the maw of your sewing machine without incident. Another hand-knitting application for a running stitch basting is before you machine-stitch a steek. If you've ever stabilized a steek using a regular machine foot, you may have experienced the heart-stopping realization that the machine stitching is s-p-r-e-a-d-i-n-g the hand-knit fabric substantially. Although the subsequent knit stitches picked up along the steek edge counteract the stretch, a line of running stitch basting with a sturdy doubled thread BEFORE machine stitching will help prevent this scary tendency to stretch in the first place. Bottom line: running stitch is best reserved for those occasions when hand knitters need to baste. Running stitch is not suitable for permanent sewing, and especially not on stretchy hand knits. added on May 5, 2008: A BIG THANK YOU to Honnay, who noted that the direction of sewing in the original version of this post was confusing. Thanks to Honnay's comment, the drawings have now been reversed, and a note about sewing directions added.